The Outbrain dashboard is completely customizable and each campaign can be updated at your leisure. In this article, we’ll run through a few of the basic settings features which will help you optimize your campaigns in no time! Click the pencil icon to the right of the campaign name you’d like to modify. This will open your Campaign Settings for editing. On the fly, using inline editing in the campaigns view. Simply hover over the budget or CPC you would like to edit and the pencil icon will appear. If you make a mistake, don’t worry – you can adjust either of these values at any time. Within the campaign settings section, you can choose from several different budget types: Daily, Monthly, or Campaign. Learn more about those here. Interested in finding out when your campaign spent it’s budget? Check out the Last Capping Time column which will show you when your campaign last capped it’s budget. To get an idea of how many customers will view your content in our network, take a look at the Reach Estimator in the right-hand sidebar. This tool provides a 30-day potential reach, allowing you to make smarter targeting decisions. When submitting a campaign or optimizing an existing one, determine if your potential reach is too broad or too specific, and make adjustments accordingly. Currently, the estimator takes audience segments, location targeting (country-, region-, and state-level only), and device targeting into consideration. If you have already set up Custom Audience segments, the option to add and/or exclude segments per campaign will show. Click into each segment box and add or exclude any segments previously created. Note that we recommend a minimum segment size of 100K users before targeting a campaign to a custom segment. Target your campaigns to a country, state, U.S. DMA or postal code of choice to reach the most relevant audience. Simply type the name or postal code of the area(s) you wish to focus on to add the location to your campaign. To import multiple locations at once, click “Import” and select an option from the drop-down. To add locations other than postal codes, click the “Other” option. Download the provided template, enter your specifications and click “Choose a CSV File” when you’re ready to upload them into the campaign. If you don’t see your desired geo-target options, please reach out to support@outbrain.com for assistance. Campaigns are automatically targeted to all platforms but you can select which platform (desktop, smartphone, tablet), which OS, and which Browser you want your campaign to target. 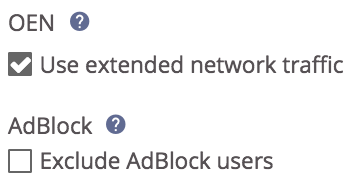 Finally, you can choose to check (or uncheck) OEN and AdBlock targeting. Check off the Adblock feature if you are a publisher who wishes to monetize your own site’s ads to users without ad-blocking software. Outbrain partners with AdBlock Plus, the most popular ad-blocking software, across a large part of our publisher network to ensure our paid recommendations are visible to users despite their use of ad-blocking software. Once satisfied, click “Save” at the bottom of the screen to finalize the campaign’s new settings. Need help navigating your settings? Our support team is here to assist.